Sharing tutorials, soapy inspiration and bits of my life on this blog motivates and inspires me immensely. I love being able to swap ideas and interact with fellow soapers! 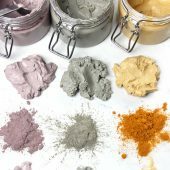 Did you know you can find more Soap Queen tutorials, inspiration and behind the scenes sneak peeks via other social media outlets? 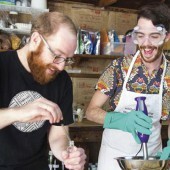 Check out all the unique, fun soapy activity happening on Instagram, Pinterest, Twitter, Tumblr, Google + and Facebook. To show our awesome social media followers extra appreciation, enter now for a chance to win one of SIX Bramble Berry gift certificates! 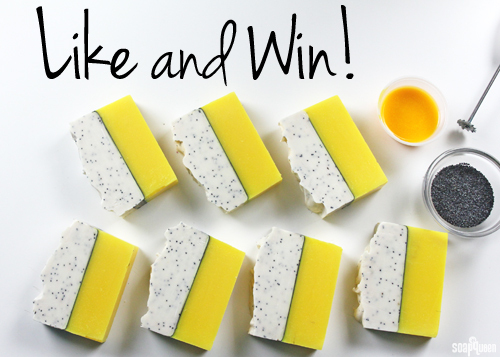 Simply like or follow Soap Queen or Bramble Berry on Instagram, Pinterest, Twitter or Tumblr (or all four!) to be entered. For each social media outlet, one follower will be selected at random to win a $15 Bramble Berry gift certificate. One winner will be selected at random from all the social media outlets to win the GRAND PRIZE $50 Bramble Berry gift certificate. Liking and following on all outlets greatly increase your chances of winning both a $15, or the GRAND prize $50 gift certificate! This contest is open to international readers and followers as well. One person may not win two gift certificates. Sign into the Rafflecopter widget below using your email. This makes it easy to contact you if you win! Via the widget below, follow Bramble Berry and Soap Queen on various social media outlets. Simply select which outlet you’d like to follow, click on the “+1” button on the right, and follow the instructions. Note: Be sure to sign in to Rafflecopter using your email, or leave a comment on the blog while logged in using your email. This way if you win, we can contact you! You can also win by just reading the blog! Select “Leave a Blog Post Comment” via the widget to be entered, and leave a comment telling us about your latest DIY project. Tweet about the giveaway to receive an extra entry for the $50 grand prize. Select “Tweet About the Giveaway,” and follow the instructions. To increase your chance of winning, you may enter with all six options. The contest ends on Monday, September 29th at noon, PDT. Six winners will be chosen at random, and contacted via email. One person may not win two gift certificates. If the winner does not respond within 48 hours, a new winner will be selected at random. What a fun giveaway! I LOVE your site and all the tutorials. 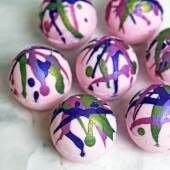 I am going to be making some Bath Bombs next. For some reason it didn’t show what I’ve done recently- most recently my DIY projects have been in the kitchen canning! I love to try to do crafy things when I have time though as gifts for people- blankets, ornaments, etc. I love BB and Soap Queen! I’m still collecting supplies as I can afford them. Currently, I’m working on quilts. I love to read everything on BB, and do quite a lot of the projects shown. Just last night I made a column swirl. I love it! I was so worried about how fast it might trace using 6 colors, but a good recipe, and waiting till close to the end worked like a dream! I’m off to try a peacock swirl. 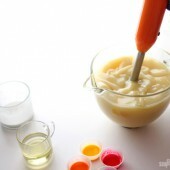 My latest DIY project is making lip balms. I love being able to make them using your simple & natural oils, waxes and butters. The end result is a handmade product that pampers my friends, family and myself. 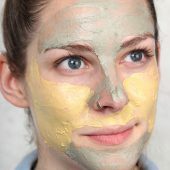 Since I am new to reading your blog, I want to make everything I read about! Thanks so much for all of your great info. 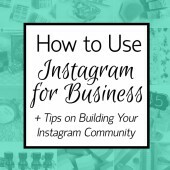 I love your blogs & learning new techniques from them! My favorite thing to do is make CP soap. 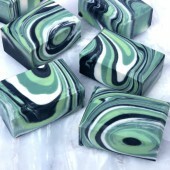 And I made 3 Christmas soaps yesterday, trying out Zihida’s method of drop swirl, followed by hanger swirl. Absolutely love all the tips, hints, helps, and how-tos on the website! What an awesome giveaway! Thank you! I love DIY, and have been quite busy recently! Some of my most recent DIY projects have been: painting my front door and shutters an eggplant purple, making a handmade wooden frame for a full length mirror, prepping my kitchen window for new trim and new blinds, and making some fall scented candles. I just love fall! Those sound like awesome projects! 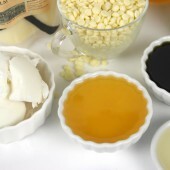 Good news – all of our fragrance oils can be used in candles. We don’t recommend using Pink Grapefruit Fragrance Oil or Pineapple Cilantro Fragrance Oil however. They smell unpleasant when burned! I joined the Soap Crafting Club and made my first two Cold Process soaps. I had been hesitant to start but have wanted to for a long time. 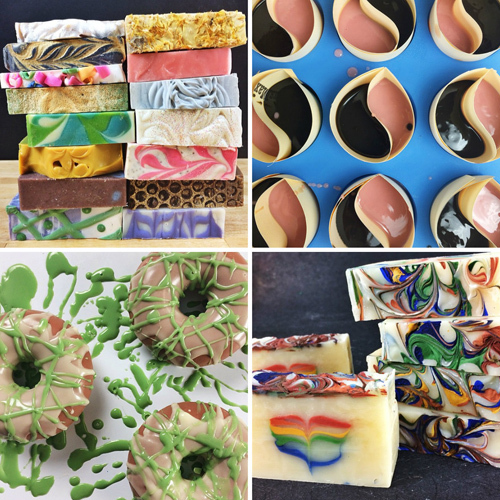 The Soap Crafting Club is wonderful!!! The support, videos, instructions, and encouragement (from you and fellow soapers)is more than I could have dreamed of! Thank you! My last DIY project was making lip balm. It was fun. Making lip balm is so much fun. Thanks for entering! Knitting a scarf was my last DIY project. This year I’m attempting to make soap and lotions again for the women in my family for Christmas. Hope it goes well! Hi! 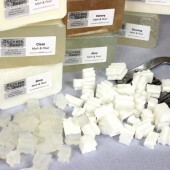 I am learning about the process of soap making and so far is something I am developing a serious interest. I still have not started since I am still researching which are the best products to start with. Thanks for all the information provided in your blog. Hope to start in time to make my own Christmas gifts. I make paper crafts and making my own soap will be excellent to make crafty gifts. And thanks for the chance to win. That sounds nice and soothing. Thanks for your entry! I do all sorts of DIY projects! My most recent completed project is knitting needles with my “Knitting Club” at my daughter’s elementary school. We used wooden dowels, a pencil sharpener, some sandpaper and beeswax paste, and topped them off with polymer clay! I’m always crafting though, and my next project is going to be some soap where I play with the colors that are on their way from BB! My most recent DIY project was a room spay. A combination of Bramble Berry’s Cedar & Saffron and Cream Cheese Frosting fragrance oils created was a winner for me; a very unexpected mix! 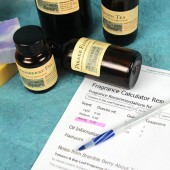 While I had my oils out, I replenished my personal scent stock incorporating Bramble Berry’s wonderful Patchouli essential oil. I’m now off to hit my stash of vintage fabrics and patterns to make some maxi skirts for fall. Long live the Soap Queen and DIY! Not sure if my last comment made it or not. Can’t wait to see your next soapy project! I am currently sewing a nice warm wool quoit and knitting another cardigan for fall! I’m really getting into making lip balm and loving the variety of flavor oils Bramble Berry carries. Are there any new flavors on the way? Also, thanks for your submission! My most recent project has been cp soap for the upcoming holidays. I made an Earl Grey soap and a Pumpkin Spice. Soaping is my favorite thing to do. My last DIY project was to make a silicone mold of shells and to make a CP seaside soap. I also made some CP oatmeal, milk, and honey soap. 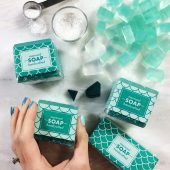 I’ve been having lots of fun with the Soap Queen Blog. I pinned a lot of great ideas this week. Can’t wait to try them out. Hope I win. My wish list for Brambleberry is really long! In preparation of my little one (now 7 months) I made a baby oil of Apricot kernel oil infused with chamomile and calendula flowers. I love it and I use for myself too! That sounds so soothing and gentle. Thanks for your entry! That’s so exciting! I’ll include a roundup of resources for beginners that is very helpful. Also, thanks for your submission! I made your Lemon- Poppy Seed Soap yesterday and it was already ready to cut today. It looks perfect!!! I followed everything exactly, except I used Energy FO for scent. Not happy with that, because I can’t smell it at all!! I used 2 oz for 3 lb. soap. For a 3 lb. 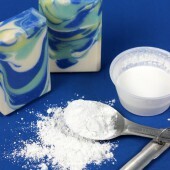 batch of soap, you can add up to 2.4 oz. of Energy Fragrance Oil for a strong scent. That should help that scent be more pronounced. My most recent project was a batch of lip balm from your site. The winter lip balm is my new favorite recipe. Hi! I love your blog, it’s so inspiring! My most recent project was three batches of cp soap. My all time favorite recipe is your lots of lather, its wonderful. That’s one of my favorites too. Thanks for your submission! I’m going to have to get on making my holiday gifts soon! My mom loves when I make her bath bombs. Last year I did the macaron shape with almond biscotti fragrance.The latest DIY I’m attempting currently is Shellac manicures at home. Trial and error because I’m not a nail tech but I’m learning! My most recent DIY was my second round of Oatmeal Stout Soap. After light trace, I split the batch and added Titanium Dioxide I purchased from Brambleberry to 1/2. 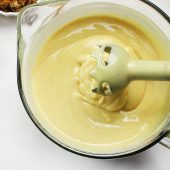 I then poured this lighter colored batter into 5 spots into the other batter. When poured into the mold it made a beautiful swirl pattern. AWESOME. I will be utilizing Titanium Dioxide again! I am also going to drag a chopstick through the points next time as well to see how it changes the swirl shape. 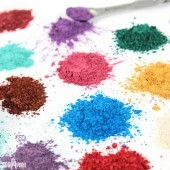 We love Titanium Dioxide here! 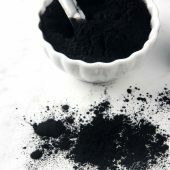 We use it in almost all of our recipes. Thanks for applying! Been working on a baby quilt on and off. Running low on soaps, I’ll have to get busy and make some more! My latest project was making a shampoo M&P bar. I have met a wonderful new friend recently and she is a CP soaper. She encouraged me that if I was planning on making a M&P shampoo bar that I would need a lot of oils. 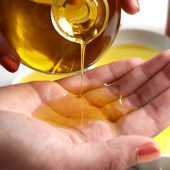 I found sites giving information on different oils for hair, scalp, and skin. I knew that M&P would be slightly difficult because of using a pre made base. So I was a little discouraged when I started but I told myself I wanted to be creative just like so many of the soapers I’ve seen from the Bramble Barry interviews. So I had my handy dandy soap book. 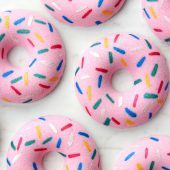 I write down orders, new creations, and tips or problems I had while soaping. So that in the future I can learn from my mistakes. 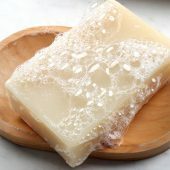 The soap had some extra oil which was causing the soap itself some problems to harden up. So I took a paper towel and dabbed it off. At first parts of the soap looked crumbly and I was losing hope but I told myself keep going and keep trying. Clearly the soap was molding with the mold I had chosen. It just needed some help. So after dabbing the excess oil off, I popped it into the freezer for about 10 minutes. I took it out and then saw that it was able to be released from the mold. I left it out in the open air for about a day or so. Then I put it in my home made loofah and have been using it as soap. There are some oils that I plan to add more of and some oils I will take away. But all in all it was a success! And you ladies really inspire me to keep trying and that not matter what happens it will be okay. 🙂 So thank you! Love your products and videos! My next shipment is scheduled for delivery tomorrow (insert happy dance!) and then I will be locked away creating all day. Cant wait. I am excited for this giveaway!! My last DIY was a men’s soap scented with Bay rum!!! I’m currently hand spinning some lovely merino fiber to be woven into a scarf. Love your products! 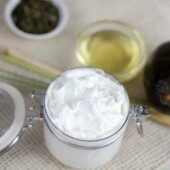 Am currently working on a combination skin facial soap recipe using your Goat’s Milk MP base. My kids and I made Goat’s Milk, Oatmeal, & Honey CP soap. It should be ready to use next week! Love BB! 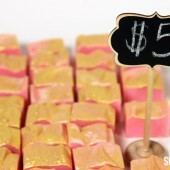 My latest DIY project is shampoo bars! Those are a lot of fun. Thanks for your entry! I am an avid soaper, however my latest diy project was making a tufted headboard. It was interesting because I drive a Chevy Spark and used it to get my plywood, the base of the project, home. Luckily the nice Home Depot employee cut the board down for me, but even then it only just fit in the car. But it was so worth it. It was a super easy project that makes my bed look really elegant. I would definitely make another headboard in the future, but maybe I would borrow a truck to get my supplies home. My last diy project was a pair of teal amigurumi dragons for a couple of little boys whose mom is battling ovarian cancer. AnneMarie, thank you so much for the awesome giveaway and all that you do! I would love to meet you someday and learn from you. You’re an inspiration to all businesswomen, mothers, and wives. 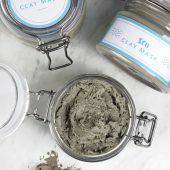 I’m currently working on creating a balm or cream for diaper rash. Thanks again!! My daughter and I just made our first bubble bars! Doesn’t look quite like yours, but it sure smells great! We used Apple and Champagne! My most recent DIY project was creating a meal planning board. It really helps with sticking to a grocery budget and cutting down on the unnecessary. I’m always looking around for my next DIY project though. They’re always fun to do. My latest project was a spa wrap made out of a towel. 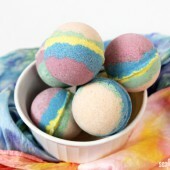 I am making these to add to mandmade spa products for Christmas. 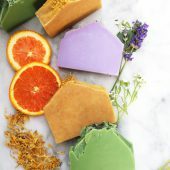 I want to make handmade soap ( my very first batch) to give away for Christmas now that I read about it while looking for other recipes for spa items. I am in the process of casting Krampus gift soaps in three different colors/scent combinations using BB essential oils for the Holidays. I love the products I’ve bought from BB so far! 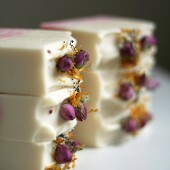 My last DIY project was cold process soap scented with rosehip jasmine. While I was making it, one of the oils got away from me, so it ended up having a bit higher than the 7% superfat I had planned! My latest DIY project was two batches of cold process soap. Love BB products and soaping, specially for a cause. 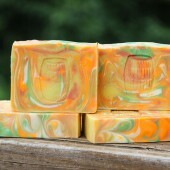 I am trying to reach a goal of raising $1000.00 with the sales of my soap. I also love opportunities to win, although I never do. Thank you for all the great recipes and tips. Good luck on your goal, and thank you for applying! My latest DIY project was making a batch of Laundry Soap. 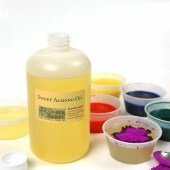 Gathering all my equipment & supplies to venture into my beginning of making soaps. ..both CP & HP…so excited! 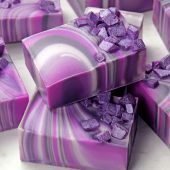 I am new to soap making and I really appreciate all the tutorials. You are so welcome. Thank you for applying! I have love all the amazing information and products I can find here and at Brambelberry. I am launching my own business which as a mom of four is super scary. Thank you so much for sharing everything you know for people like me to learn from you. It’s been a while since I’ve been able to do a DIY project, but I’m going to make a batch of CP goat milk soap (hopefully tonight!) using alkanet-infused olive oil to make a swirl. I haven’t used alkanet before but infused some in oil a couple of weeks ago and have been dying to try it since then (but got sick and then busy trying to catch up from being sick). I’m also teaching a cross-stitch class to our homeschool co-op starting this week, so I’m working on some projects for that as well. My latest craft project is my biggest yet – opening an Etsy store! 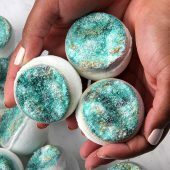 Soap, bath bombs, etc…I just have too many ideas – I need to sell some so I can make more! I love your websites! They are so informational, and there are so many products and projects. I just ordered my first package on Sunday and I can’t wait to get it! My most recent project was a crochet heart scarf for my niece-in-law…. I’m currently working on some crochet button flowers. 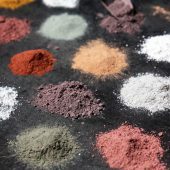 I absolutely adore your site, your recipes, tutorials, etc! I’m definitely going to be ordering again very soon! I’ve been eye-balling the coffee butter!! 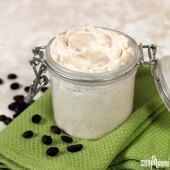 I make body butters & that coffee butter sure looks & sounds amazing!! I’ve been learning to needle felt! It’s so relaxing, and I can work on little projects while I watch tv, spending time with the hubs, or bring them to markets with me to have something to do behind the table. I’d love to win a gift certificate to stock up on some of my favorite BB fragrances! That sounds just perfect. Thank you for applying! Thanks for the chance to win. I love the inspirations and tutorials. I just made the lemon poppy seed soap. In addition to our soap making business, we are restoring an old home! That’s PLENTY of DIY! LOL! We love Brambleberry products, purchasing from you and learning from you! There’s always something FUN to do! Thanks to Ann-Marie and the Brambleberry family, I have found a new hobby that has allowed me to do something special with my Mom. 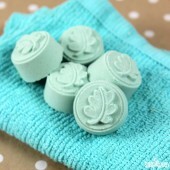 We are also able to provide a great gift for my cousin’s wedding by doing small soaps for her wedding favors. I really love soaping and just wish I would hit the lottery so I could do it every day!! 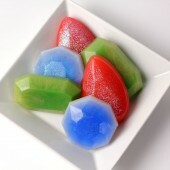 Now we are trying to get our own business off the ground and so far everyone loves our soaps. None of this would be possible without Soap Queen and Bramble Berry along with everyone in the soaping business!! How sweet, I bet they love it. Thanks for your submission! My last DIY project was making a curtain for my back door to keep the sun out. the fabric is blue with little mice & cheese so cute! Thanks for offering the prizes! Oh yeah that and thanks for getting me addcited to instagram lol. This is awesome!!! 🙂 My most recent & completed DIY project was my 1st pumpkin puree soap of the season…one of many more to come, I’m sure 🙂 There is just something about pumpkin that people love! Getting ready to make another soap right after this! My most recent DIY project was making a dress (my first dress ever!) for my eldest niece! I definitely need to keep working on my sewing skills, but it’s a great hobby while my soap supplies are in storage! 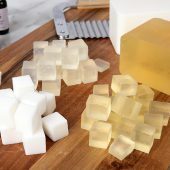 You’ve really inspired me to try out soap making! I’m gonna start my first melt-and-pour project for Christmas presents soon!!! My last DIY project was a handmade ring sling. It came out great and I saved a fortune making it myself. 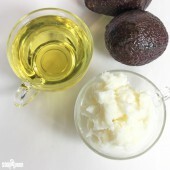 My last DIY was a lotion recipe I got from this site here on SoapQueen! I split it into 2 batches and fragranced one with Deep Blue Essential Oil by Doterra for Muscle Pain/Soreness, and the other half I scented with Helichrysum Essential Oil. It turned out so well, I am extrememly happy with it and it feels so wonderfully smooth. I am in love with the pumpkin spice cp soap. That is my current project. My last project I turned an old vegtable bin into craft storage. I painted it in bright pastel pinks, blues, and greens with decoupaged fabric on the doors. I just love the smell of that soap. Thank you for applying! Liquid soap. Not bad! Next I’m going to make the oatmeal one out of the soap crafting book. This looks great, happy it’s open to Canada as well. Just read the rafflecopter. My most recent DIY project was making deodorant. 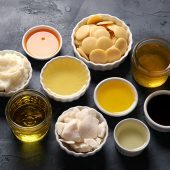 I have mixed up a 28# bucket of my master batch oils this week so that I can crank out 10-11 #3 individual batches of soap next week, many using BB’s fabulous fragrance oils. Many of these bars will be donated for the 1000 bar soap sale that I do in the spring to raise funds for our Church’s high school summer mission trip. I love your tutorials, they’re so informative! After learning about the health benefits, I’ve recently added water kefir to my diet. This could be considered a diy because the water kefir grains need to be fed and tended to several times a week. Although I’m not a fan of soda, I do enjoy this bubbly alternative which can be flavored in many different ways. Is water kefir a part of your healthy diet? I have been busy wrapping empty boxes for presents. They are being used as risers for my holiday bazaar table. I decoupaged the cabinet I keep my fragrance oils in. Turned out very pretty. But, I think I need a bigger cabinet! 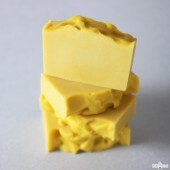 I love your cold process soap tutorials. They were clear and well explained. I knew that when I made soap according to your tutorials they would turn out the way I wanted them to. My most recent diy project is organizing all my craft supplies. Does that count?! I helped my 9 year old on a 6 page scrapbooking layouts. Love your site and Thanks for a chance to win. I love your sites & book!! The information & videos gave me the courage to get started soaping & has been extremely helpful. Thank you so much for all you do!!! I’ve been INCREDIBLY busy with gardening this summer and got a WHOLE bunch of pickling cucumbers. I canned 14 quart jars of dill pickles last night! 😀 Starting on my tomato stuff today! Have not ever made soap, but really want to. I hope to start after all the gardening, canning, and dehydrating frenzy! Harvest time, so my last DIY project was canning peach salsa. Yum! With tomatoes, onions, garlic, and jalapenos from my garden and local peaches. In addition to making and selling lotion bars on Etsy, I also knit and spin yarn, so knitting projects are usually my most recent DIY! My latest project is gift bags for my co-workers whom I will be leaving soon as I transition to a different department. 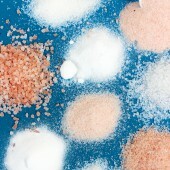 I’m making bath fizzies and body butter scented with BB’s Crisp Apple Rose fragrance. I may even add a soap. That fragrance is wonderful in everything I’ve tried! I love watching and reading everything Anne Marie does and I have learned a lot! My DIY..I have actually been able to create, through trial and error, a shampoo/body bar that all my customers are absolutely loving! I taught a homeschool group about CP soap making. 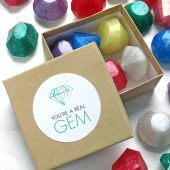 Love Your Site, Your Store and Your Fabulous Tutorials! 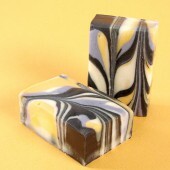 My latest project as a Lemongrass & Basil Soap which turned out so pretty and smells divine. Thank you for the inspiration and the opportunity to win a Brambleberry Gift Certificate! I just made 2 bracelets last night! I have a friend who keeps ordering car seat blankets from me for shower gifts. She just ordered four that she needs in October (ack!) so all of my time has been devoted to those. Love all the ideas! So creative and helpful! 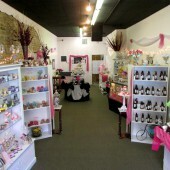 I would love to win a gift certificate from Brambleberry. I need more soap scents! My most recent project was a special request. Someone asked me to embed black african soap in another soap base because she likes using the black african soap but it’s crumbly and she thought it would be easier to use if it was mixed into another soap base. What I wound up doing was making a coconut soap recipe I found, mixed it to trace and took about 1/2 lb. of crumbled black african soap and mixed it in. 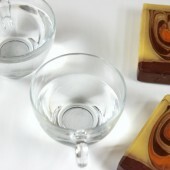 The resulting soap has a nice contrast between the dark crumbled soap and the light soap base. My last project was to sew trow pillows to match my new beding. My latest DIY is making more congestion salve for the upcoming season! This is so great! Thanks so much, Bramble Berry. At the moment I’m actually attempting to make some wooden soap molds. It’s taking me some quick thinking but I think they’ll turn out nice! Not one of Bramble Berry’s product has ever disappointed me! Keep on the great work! Thank you for saying so, and thanks for applying! 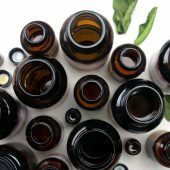 My most recent project was homemade “Vicks”, however I didn’t have olive oil and used coconut oil and my husband wasn’t thrilled about the smell so I will have to go get some olive oil and try that. I have all sorts of DIY projects going at any time! Most recently I am helping my husband tile our bathroom! A good team project!! I am a gardener and my latest project is painting (spray painting) dried seed heads to use them as decorations.. iris, artichokes and globe thistle so far..
My most recent project was a set of oil based sharpie mugs for a coworker’s niece. One said Mr. Right, the other said Mrs. Always right. 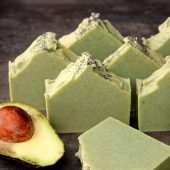 The last DIY was one of your Soap Club subscription projects, the Avocado soap. Loved it! 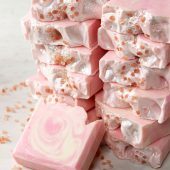 I hope you will be continuing the Soap CLub because it is a wonderful way to try new techniques and ingredients. Thanks!! We are definitely continuing that club. Thanks for applying! My most recent project was making hot process wine soap for an event at a local winery show casing local crafters. 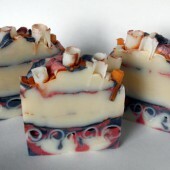 I used Brambleberry Berrywine FO for one of the soaps that was made with the winery’s strawberry wine. Smells yummy. Your tutorials, articles & posts are so informative and inspiring. Thank you for all your hard work! I love your products. I used the Oval 3D mold in my last project. Love those molds. Thank you for applying! Good luck, and thank you for applying! I just finished making a batch of Christmas soap that I am calling Figgy Pudding with Brambleberry’s Moroccan Fig fragrance oil. That sounds so awesome. Thank you for your submission! i just love how creative and helpful you are. 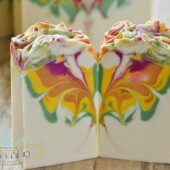 my latest project was a rainbow cold process soap. I just made my second batch of cold process soap! Just made two new holiday soaps. Sparkling Cranberry Orange & Vanilla Sandalwood. Vanilla Sandalwood is one of my favorites. Thanks for applying! I love Brambleberry! I use your ingredients almost exclusively to make my Namaste Soaps: https://www.etsy.com/shop/NamasteSoap. So fantastic! 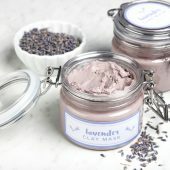 I love brambleberry- you all inspired me to start soaping and I fell in love with it so much I started selling my creations! 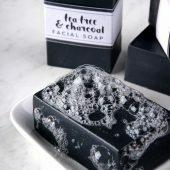 I love your site and it inspires me to make more soap~! knitting my daughter a winter hat and making solid bubble bath. Both projects sound like a lot of fun. Thanks for your entry! I have been making Halloween costumes for my 4 kids and a quilt to give my husband when he returns from deployment. He just requested some soap so I ordered some supplies to start that project next! Thanks for the great giveaway! I love this site and have been learning so much from it. You are an inspiration to me and my soaping business. 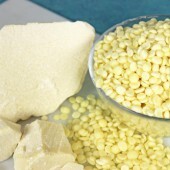 My latest DIY project was a frankincense and myrrh soap. 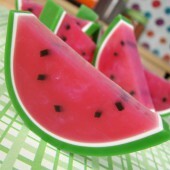 I used small plastic food storage bowls found at the dollar store as molds. 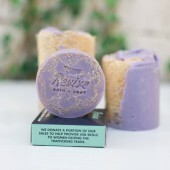 They make the most wonderful hand-sized oval soap bars. My customers love them. My most recent diy projects were a strawberry margarita lip balm, a sea salt hair spray and no poo shampoo! I just love experimenting! I love Brambleberry! 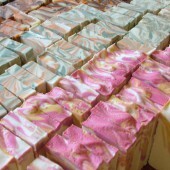 I love the tutorials that Anne Marie gives on Soapqueen TV and I have learned a lot about making soap. I have always done crafts. Sewing, candles, and now I am in love with soaps and all the bath delights that I have learned to make. I am doing two bazaars in November and a big sale this month. Thanks guys! I really appreciate you. I love your site. 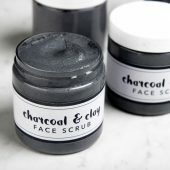 I use your products & recipes as I like making my own beauty care products. We absolutely LOVE Brambleberry’s products! We just finished creating Fifty Shades of Blue with Tobacco and Bay Leaf fragrance oil. It’s heavenly! What a wonderful contest. Gives lots of chances to win too! I’m so glad it’s open to international users as well! You are awesome! I tend to come to your site for great ideas on what to make. 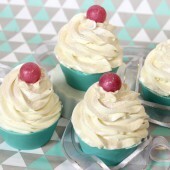 I used your tutorials as inspiration for making bath fizzies and I hope they turn out half as well as yours. Thanks for a chance at the awesome giveaway! My latest project has been making tshirts for my soap biz. I use glitter vinyl and cut it with a vinyl plotter. I love making soap, but vinyl projects are my other favorite hobby! Yay! I think the comment thing is fixed!! I love Brambleberry & this would be awesome to win! I’m glad to hear that. Also, thanks for entering! Besides being addicted to quilting, I am now addicted to soap making. 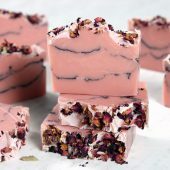 My last DIY was a pink grapefruit/mint soap with rose clay. It smells wonderful and is still curing. Your sites are so informative and exciting. 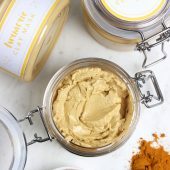 I also love all your products…..wish I could buy one of everything! Thanks for the chance of winning a prize!! Thank you so much for your kind words, and for your submission! I love your sites! They are so inspiring. My last DIY project was making lip balm. Just starting into making my soaps. Took me a little bit to get my nerve up to dive in.